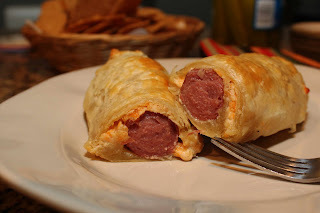 In honor of National Corn Dog Day, I couldn't resist the chance to recreate this classic dough wrapped hot dog. It combines all of our favorite ingredients into one; for Dave it's the breaded dog and for me it's the meat on a stick that really sells it! As I began to make my adult version of this theme park favorite, Dave asked why we couldn't just have regular corn dogs. Answers lofted through my head - Staying away from fried food, not good for you, the house will smell, I don't shop in the frozen isle... but what it really came down to was that I just like to put my own spin on things. What's the point of the exact replication? If they cloned the Leaning Tower of Pisa - would you be as excited to take a trip there instead of to the original Italy? Would you pick apart the things that are wrong or slightly different than the one you remember? Do feel free to insert a stick into these not-exact-replicated dogs if it makes your loved one feel better! Have fun with cooking, be adventurous, but if you want a regular old 'childhood' corn dog, I would suggest driving to your local fair grounds and getting the real thing. Either way, be fat and happy while you do it! Tips and techniques: Careful not to overwrap or double up the dough. The outside will brown but the inside might still be doughy. Just once around with the dough is plenty. It's important to pinch the seams together or the cheese will leak out during cooking. Mix the cream cheese, cheddar, worchestershire sauce, tobascco and garlic powder together and set aside. 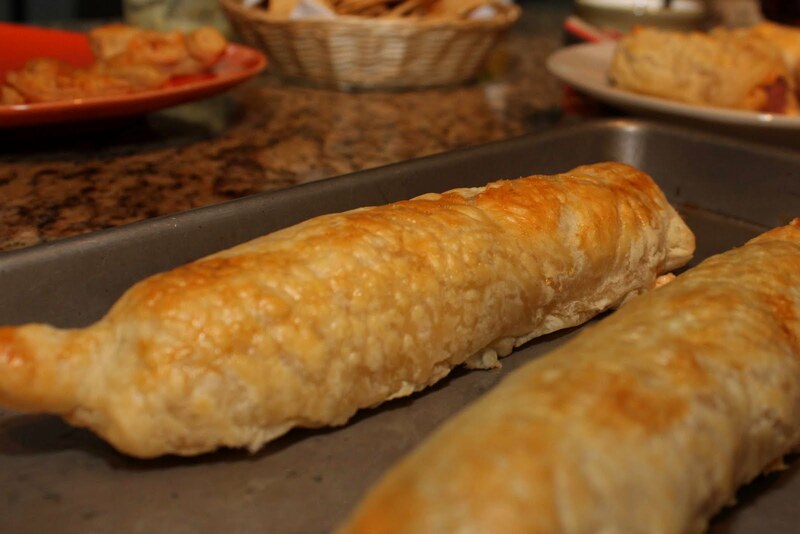 Roll out the Phyllo dough so it's about twice the size of what you started with. Carefully plan out how to wrap up the dogs; I used all four corners, and into the center. Cut the dough, place the hot dogs on the dough. Before wrapping them up, spread the cream cheese mixture onto each dog. Then wrap up each and pinch the seam together, use a little water to help the seams hold together. Place seam side down on a lightly greased cookie sheet pan. Brush the tops with the egg for a more polished look. Place in the oven for about 30 minutes, or until the corn dogs are all golden brown, at 375 degrees. Enjoy!